1/43rd scale diecast model of a Peugeot 404 as used by the British South African Police (BSAP) in the former Rhodesia, now known as Zimbabwe. Model produced marketed by DeAgostini for the Russian market. 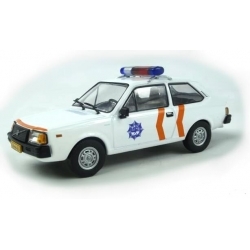 Model comes mounted in a blister pack with Russian language magazine featuring photos and articles relating to the vehicle and depicted Police Service. See additional images for photo of the real vehicle.